Today's Thursday Thirteen is very late, but then again I did spend all day away from the computer taking these very pictures. 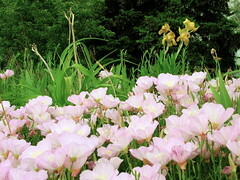 I hope that you enjoy them. This was a spontaneous trip to lift my spirits and stave off Depression. Never give up. 1) Today I decided to be spontaneous. I know that sounds like I'm not ACTUALLY being spontaneous, but it was a decision on a whim so I think it counts. I wanted to record 13 things that I saw today and put them up on my blog for Thursday 13. My first image was right across the street from my house. Even though it was an overcast and smoggy day, I was determined to take 13 pictures anyway. 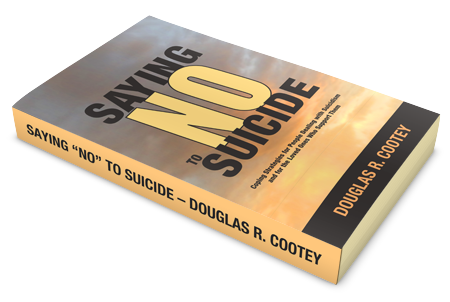 2) After picking up my daughter from school I suddenly took a left instead of a right and very quickly left our humdrum world behind us. Soon we were in Magna on Highway 201 and this scene caught my eye. 3) Normally, the Wasatch Mountains fill my vistas. Today we went to the other side of the valley and enjoyed new shapes and silhouettes. 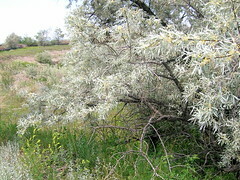 4) As I was exploring a rest area, I noticed a flash of movement to my right. Something was trying to hide from me. We played peek-a-boo for a while before I finally caught him on film. 3X Zoom just wasn't enough, but he's there if you look closely. 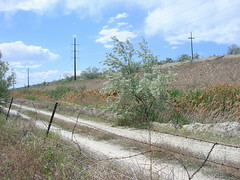 5) All around the rest area, on the other side of the fence, lush vegetation was sprouting up. 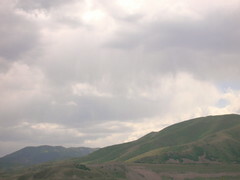 It stood in stark contrast to the dry hills behind us. 6) Apparently, the rest area was as close as we could get to this roadside cave. I'd have to cross the highway, scale a divider, cross the other lane, jump a fence, go down into a gully, and climb up a mountainside, but then I could find refuge inside the cave as travelers of old used to. 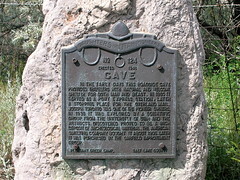 7) Here's a bit of history about the roadside cave. Personally, I'd rather be allowed inside the cave. 9) Just as I walked up to the tumbleweed, the wind picked up and sent the tumbleweed on its way again. What a crazy, but effective, way to propagate seeds. 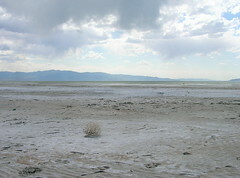 The tumbleweed's trip ended shortly, however, as it came to a rest in the Great Salt Lake. 10) I really enjoyed sharing this experience with my girls. They had a blast. Too bad Robyn couldn't join us, but she was at work. 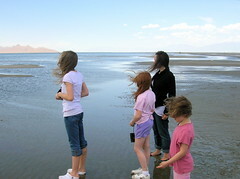 Unbelievably, the Great Salt Lake is only 20 minutes away from us. We've just been too busy to explore our local environment. 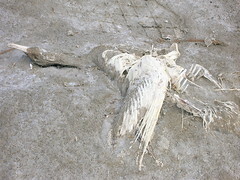 11) A very grisly scene greeted us as we walked back to the Saltair parking lot from the lake front. 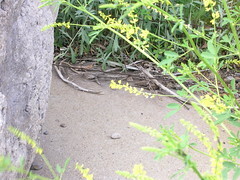 Unnoticed to us the first time, there was a band along the beach like a geological layer of dead birds bleached by the sun and partially interred in the sand. This poor critter was the most exposed and preserved. 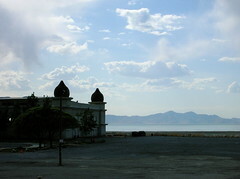 12) The history of Saltair is an interesting one. I remember swimming in this area when I was a child of 5. The salt water was thick and coated my skin with a white crust when it dried. There were people everywhere. That was only 3 years after the final fire finished off the Saltair. People still used the docks and fascilities. Then the water receded again and all was abandoned and taken down. Only a few people were around today to walk around the ghosts of the past and enjoy the serenity of the lake. 13) In 1981, a new Saltair was built out of an old airplane carrier - a far cry from the opulent architectural masterpiece the old Saltair was. 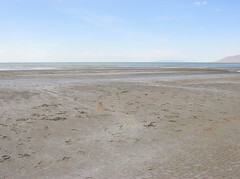 A few months later, the lake tried to reclaim the new Saltair and it was abandoned. Now it is free again and bands hold rock concerts there. 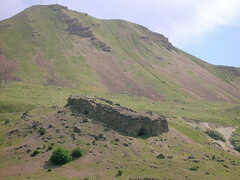 Despite nature's insistence on ruining Man's plans, Man continues to build there. 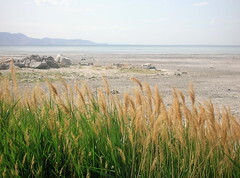 Even if this Saltair burns down and is swallowed up by the Great Salt Lake again, I am sure that Man will rebuild just as soon as the lake recedes. It was a great day. Here's to spontaneity!